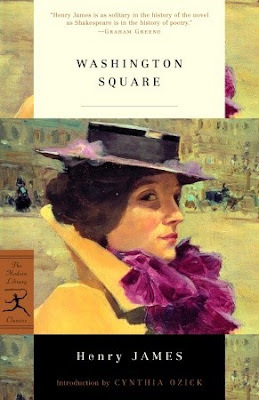 Washington Square follows the coming-of-age of its plain-faced heroine, Catherine Sloper. To her father's eternal frustration, she is wooed by a handsome opportunist by the name of Morris Townsend. After years of life with only her father and her ridiculous Aunt Penniman, Catherine is drawn to Morris' charms. She is flattered by his attention and refuses to believe that he could be intent on claiming her fortune. Forced to choose between her inheritance and the man she loves, Catherine's decision could change the course of her life. Washington Square is one of Henry James' most straightforward and shortest works, which is why I thought it would be an interesting way to read more from this author. I read and enjoyed Daisy Miller, but I don't yet have the fortitude to push my way through The Portrait of a Lady or some of his other, longer works. This is a small tale. Catherine is, in many ways, a small heroine. She has a very small existence. She lives with her father and her aunt, and she seems to do very little else besides exist in the world. She has a small future. Her father believes that she will never make a great match since she is a rather plain and simple girl. But what she does not lack is a fortune. She is an heiress, and anyone knows money can often compensate for other things one might lack. The problem is that the plot is also small. It seemed to me that very little ever happened. I didn't finish this book quickly, even though it was a really short book. The story seemed to finally reach a climactic moment, but then it just sort of ended. I think what made it the hardest to read was the fact that none of the characters were very endearing. Don't get me wrong, they aren't one-dimensional characters. James was obviously a good writer. It's just that they are all kind of off-putting - I wouldn't want to be left in a room with any of them. All that being said, this book was very well written. I want to get back to my love of classics this year, which is why I am going to try to read at least one a month. I'm glad I started off with this quiet novel because it reminded me of the fact that many classics rely more on characterization than plot to drive the novel. In a time when vampires and fallen angels seem to be dominating the literary market, it was actually refreshing to read this book... even if I wouldn't say that I really liked it all that much. It definitely got me excited about reading more classics though! "It seemed to Catherine that no one who had once seen him would ever forget him; but though she made this reflection she kept it to herself, almost as you would keep anything precious."